A laparoscopy (keyhole surgery) is a minimally invasive procedure requiring a general anaesthetic. The procedure is undertaken in order to establish a diagnosis in patients with emergency or long term abdominal pain or in patients with abnormal findings on their imaging scans. Depending on the findings therapeutic procedures can be delivered at the same time. These potential procedures will be discussed with you prior to the procedure. Sometimes scar tissue inside the abdomen between bowel loops can be broken down (adhesiolysis) using laparoscopy. Laparoscopy can also be performed as part of another procedure such as emergency appendicectomy, hernia repair, or bowel resection (coloctomy). The procedure takes place through small incisions on your abdomen, 0.5-1cm typical size, through which gas is inflated in order to create space and make internal organs easy to see. 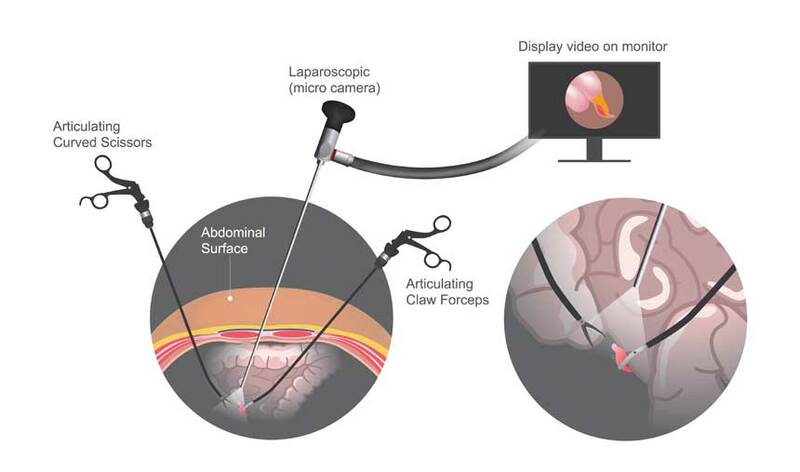 A tiny camera (laparoscope) is then inserted into the abdomen guiding the insertion of further specialised laparoscopic instruments which are used to inspect the organs inside the abdomen and establish a diagnosis or deliver a treatment. The benefit of a laparoscopic procedure compared to an open laparotomy, is that patients have less discomfort following the procedure and return back to normal activities much faster. There is a reduced risk of bleeding and wound infections, as well as less scarring inside the abdomen with the subsequent risk of bowel obstruction, while the smaller abdominal scars offer a better cosmetic result. After the procedure you will be taken to the recovery room. Diagnostic laparoscopy is normally performed as a day case procedure but sometimes patients may need to spend a night in hospital depending on any additional procedures performed. You are typically expected to go home once you are eating and drinking, are able to manage the pain and walk unaided and have passed some urine. You will be informed of the diagnosis and any follow-up arrangements in anticipation of any results from biopsies. Recovery depends on whether any additional procedures are performed. If no additional procedures have been performed you should be able to return back to work within 24 hours. You will not be able to drive for 24 hours, you need to avoid alcohol and signing any important legal documents and need to ensure that a responsible person will be with you for at least 12 hours. If no additional procedures are performed the risks include complications common to all surgical procedures such as infection, bleeding, blood clots, heart problems, pneumonia, temporary inability to pass urine, damage to organs inside your tummy, anaesthetic risks and development of future hernia.